Being punctual is not one of James Dempsey’s strong suits, but the same can’t be said about his pot-limit hold’em game. When the cards were in the air at 2:30 p.m. on Saturday, Dempsey’s seat at the final table was empty and his stack was being blinded off. However, being 15 minutes late to the final table didn’t stop Dempsey from acquiring all of the chips in play and earning him his first bracelet and first-place prize of $197,470. Dempsey bested a field of 650 players over three days of play to win event no. 9, a $1,500 tournament. Some notables who cashed in this event included JJ Liu, who came in third, Steve O’Dwyer, Christian Harder, Joe Serock, Scott Montgomery, and Justin Young. It only took five hours of play to see the final table go from nine players to just two, with Dempsey knocking out JJ Liu to go heads-up with Steve Chanthabouasy. The two of them, however, took another two hours to decide who was going to win the bracelet. At the beginning of what was easily the loudest heads-up match of the 2010 World Series of Poker, with plenty of noisy supporters for both players, Dempsey held better than a 2-1 chip advantage over Chanthabouasy. Chanthabouasy refused to give up and after his flopped straight held up against Dempsey’s top two pair, he actually took the lead. Dempsey remained calm and collected even though his chip lead had vanished. He continued to play well and picked off a few ill-timed Chanthabouasy bluffs to get back on top. After his A-10 held up against Chanthabouasy’s A-7, his supporters erupted and engulfed him in a sea of hugs and pats on the back. 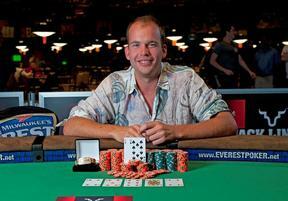 Dempsey became the second the British player to win a bracelet this year, after Praz Bansi won his a few days earlier. Steve Chanthabouasy raised to 30,000 from middle position and was called by Gregg Wilkerson on the button and JJ Liu from the big blind. The flop was Q J 9 and Chanthabouasy bet 37,000 after Liu checked and Wilkerson moved all-in for 102,000 more. After Liu folded, Chanthabouasy went into the tank for nearly five minutes before making the call. Chanthabouasy was not happy with what he saw when Wilkerson showed the A A and he held the A Q . The turn was the 4 , giving Chanthabouasy a flush draw along with his top pair. The river was the K , completing the flush and sending Wilkerson home in ninth place with a bad beat he won’t soon forget. Steve Chanthabouasy raised to 50,000 and Ed Brogdon moved all-in for 88,000 from the small blind. Chanthabouasy made the call and showed K K and held a commanding lead over Brogdon’s 9 9 . The board ran out A J 3 2 J to eliminate Brogdon in eighth place. Joseph Williams raised to 70,000 from under-the-gun and Steve Chanthabouasy moved all-in from the big blind. Williams made the call and it was off to the races. Chanthabouasy showed 7 7 and Williams had the A 10 . The board came 6 3 2 8 4 and Williams was eliminated in seventh place. With the knockout, Chanthabouasy climbs to 670,000. Action folded to Armen Kara in the small blind who raised to 70,000, only leaving himself with 80,000. Mark Bebekov called from the big blind the flop came J 7 5 . Kara then quickly moved all-in and Babekov decided to call. Kara showed 10 5 , giving him bottom pair and was ahead of Babekov’s K 6 . The J fell on the turn but the 6 on the river gave the pot to Babekov, and sent Kara to the rail with over $33,000 in his pocket. Scott Haraden raised to 50,000 under-the-gun and was met with a three-bet to 130,000 from James Dempsey. Haraden called and they saw the flop of Q J 5 . Haraden moved in his last 90,000 and was called by Dempsey. Dempsey showed K J and Haraden showed the 7 6 . The turn was the 5 and the river was the 2 and Dempsey was able to fade the diamond and increase his chip lead, while eliminating Haraden. In a battle of the blinds, Mark Babekov and Steve Chanthabouasy got into a preflop raising war in that resulted in Babekov getting all in and the cards being turned up. Babekov showed the A 9 and Chanthabouasy had the K K . After a flop of K 8 4 , it was all but over for Babekov. The 4 on the turn gave Babekov a flush draw, but it gave Chanthabouasy a full house and Babekov was drawing dead when the 10 came on the river. Babekov received a little over $62,000 for his efforts. James Dempsey raised to 60,000 and JJ Liu three-bet to the size of the pot. Dempsey raised enough to put Liu all-in and she called. It was a classic race situation when she held 8 8 against the A K of Dempsey. Dempsey hit gin on the flop when it came K Q 4 , leaving Liu with just one out. The turn was the A , which unnecessarily improved Dempsey’s hand to two pair. The 6 on the river gave Dempsey a flush and left Dempsey and Chanthabouasy heads-up for the bracelet. Steve Chanthabouasy raised to 150,000 and was met with a three-bet from James Dempsey to 450,000. Chathabouasy moved the rest of his chips in and Dempsey made the call and the cards were put on their backs. Chanthabouasy showed A 7 and was dominated by Dempsey’s A 10 . The fop of 4 5 6 brought some drama though, giving a straight draw to Chanthabouasy. The turn was the Q and the 4 bricked off for Chanthabouasy, eliminating him in second place and giving the title to Dempsey. Chanthabouasy takes home $121,963 for his efforts, while Dempsey will take home the bracelet and $197,470.